This paper of Topoi research group (D-3) Theoretical Concepts of Space develops a novel methodology, combining history of mathematics, philology, philosophy of mathematics, and logic. We develop a formal logical treatment of Euclid’s Elements, in which set theory plays no role, but the logic of part and whole does. We first consider a controversy about the nature of Euclid’s Elements Book II. 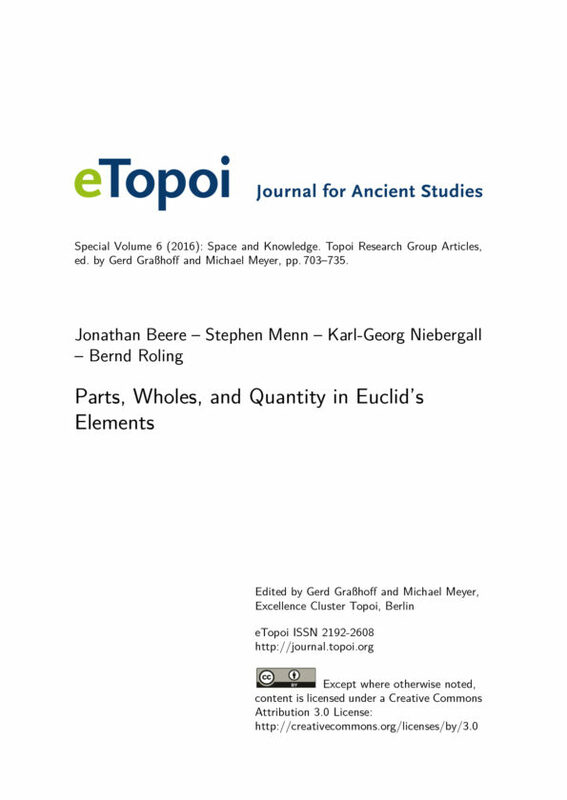 For Euclid, the part-whole relation plays roles that are now played by arithmetic operations. This shows one crucial limitation of the controversial interpretation of this text as geometrical algebra. Returning to the beginning, we present a formal language for stating Propositions 1 through 10 (omitting 7) and proofs of them. Surprisingly, this has never been done (except for one recent approach, which differs from ours in an essential way). We conclude by sketching several significant ways in which this project can be further developed. Jonathan Beere ist Professor für antike Philosophie und Wissenschaftsgeschichte und Direktor der Graduate School of Ancient Philosophy an der Humboldt-Universität zu Berlin. Seine Forschungsschwerpunkte umfassen antike Philosophie, Metaphysik, Moralpsychologie, Philosophie des Handelns, Philosophie der Mathematik und die Philosophien von Kant und Wittgenstein. Stephen Menn works on ancient Greek and medieval Arabic and Latin philosophy and mathematics. He has PhDs from Johns Hopkins University in mathematics (differential topology) and from the University of Chicago in philosophy. He is the author of Plato and the Method of Analysis, of the forthcoming How Archytas Doubled the Cube, and of Eudoxus’ Theory of Proportion and his Method of Exhaustion. He has written a book-manuscript titled Feuerbach’s Theorem: An Essay on Euclidean and Algebraic Geometry. Karl-Georg Niebergall is Professor for Logic and Philosophy of Language at the Humboldt-Universität zu Berlin. He studied Logic and Philosophy of Science, Mathematics, Physics and Philosophy at the TH Darmstadt and at the LMU Munich. He received his doctorate in Philosophy, and his Habilitation in Philosophy, Logic and Philosophy of Science at the LMU. In 1997 he was a visiting scholar at Stanford University. His main areas of research are: logic, philosophy of language, ontology, and philosophy of science. Bernd Roling (Dr.Phil., Münster 2002; Habilitation, Münster 2007) ist professor für lateinische Philologie an der Freien Universität Berlin und Sprecher der research group (D-4) Immaterial Causes and Physical Space. Daneben ist er Leiter des Projektes “Rudbeckianismus als ein Forschungsparadigma an skandinavischen Universitäten” im Rahmen des SFB 644 Transformationen der Antike an der Humboldt-Universität zu Berlin. Seine Forschungsschwerpunkte umfassen: mittelalterliche und frühneuzeitliche Philosophie, Wissenschaftsgeschichte und Universitätsgeschichte, besonders in Skandinavien, sowie lateinische Literatur von 450 n.Chr. bis heute.